ROB TAYLOR is an artist and President and Publisher of Superhuman Works, who has more than 15 years of comic book experience with Marvel Comics, DC Comics and Image Comics just to name a few. 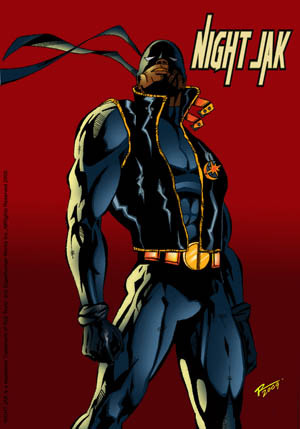 After working with Spawn creator Todd McFarlane in Arizona, Rob wanted to start his own line of comics using his very own created characters and comic book company Superhuman Works.NIGHT JAK is the first superhero created by Rob, and his brainchild he will play a very intricate part in the SW universe as a whole to all the other title characters he wants to release. R: Well, I’ve always loved comics since I was a kids. Lots of kids in my neighborhood had them. I didn’t have any so I would go to their houses and read them. One day my mom came home from work and she had about 3 boxes. So now that I had my own kids would come by my house to read and draw all our favorites. At a young age I knew, this is what I wanted to do with my life. Draw comics. R: Yes. I’m an artist. So anything that remote related to what I did and wanted to do my interest was in it. R: Jack Kirby, Sal Buscema were my favorites. They were the greats. I think they inspired any who loved comics. R: It goes back into being a kid. Its something I did’nt have to think about doing. I was always drawing marvel and DC heroes. I thought if a drew the character the way the pro’s did, I could get a job in comics when i grew up. R: Not at all. That’s something that I separate from comics. Its not that serious with me. R: Well my college education played a small part in becoming a comic book artist. (1998-2000 Collins College. Tempe, Arizona BA,. Visual Communications) But the majority of my education came from within the industry. I interned with three comic companies before I went into college. So had my game plan down when I came back home. (NYC). R: It took me years to train and get help from others learn as much as I could about the different mediums in creating comics. I like computer coloring but I’m an artist at heart. So that’s were I am now. R: I liked the Acclaim Comics stuff. I was their for six years. And I had the chance to touch on some of their properties being there. R: I write also and that takes the egde off sometime when I have been draw like 4 or 5 days straight. R: I wanted to show my skills to the comic book community at large To let people know there are BLACK comic book artists and writers out there that are just as good as the main stream( without stepping on toes) artists. R: I would say on a racial front that its important for people of color express this pop culture so than we can inspire others who never thought we exist. Therefore, we bring black characters to the forefront. Not as sidekicks and playing second to a white superhero. Our characters can take center stage do the job just as well or better. R: Stay the course! Let nothing stand in your way. If this is what you really want to do with your life, be ambitious, be creative and steadfast. Most of all you have to LOVE what your doing. Money is an important factor in this business but the love of it best of all. And make it FUN.